We at St. Elizabeth Ann Seton Church hope that your wedding day will be a wonderful celebration of the Sacrament of Matrimony and a day of great joy for you, your families and friends. The guidelines below should assist you in making all the elements of your wedding celebration at St. Elizabeth’s a happy one. The information below will give you some idea of what has to be done to prepare for a wedding in the catholic church. The priest assisting you in preparing for your wedding will help you with the details. According to the appropriate canon law governing the celebration of marriage, the wedding must be celebrated in a parish church (either the bride’s or the groom’s). You should, therefore, be a registered, active, participating member of the parish where you want to receive the sacrament. Every couple planning to be married must undergo a process of preparation. The directives from the Catholic Bishops of Missouri require that the couple contact the parish priest and begin the preparation at least six months prior to the desired wedding date. It consists of taking FOCCUS (a tool to assess a couple’s readiness for marriage), discussing the results of that with the minister celebrating the ceremony, and participating in one of the following three programs: our Parish Preparation Program, OR the Archdiocesan program Preparing for Christian Marriage, OR the Engaged Encounter Weekend. Any Catholic priest or deacon, in good standing with the Church, may celebrate your wedding here at St. Elizabeth’s. 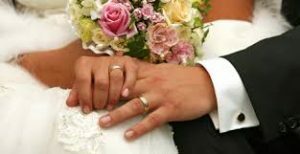 Normally, the priest or deacon who celebrates the marriage also completes the Premarital Investigation Form with the bridal couple. Should you desire a celebrant other than one of the priests or deacons assigned to St. Elizabeth’s, please contact the pastor. You must make an appointment with the pastor in order to obtain permission for the celebrant of your marriage. As mentioned above, please contact one of the priests of St. Elizabeth Ann Seton at least six months prior to the desired date. Be sure that the church and priest are available for your wedding before you make final plans with others involved in the wedding or reception. Please don’t book the hall before you have a firm date with the church. Weddings are usually held on Friday evenings at any time and on Saturdays between 11:00 AM and 1:30 PM. Due to the regular use of the Church for confessions and Mass we will not begin a wedding any later than 1:30 PM on Saturday. Although weddings may be held in Advent (the four weeks before Christmas) and Lent (the six weeks before Easter), we discourage weddings during these seasons. According to the liturgical law of the Church, weddings celebrated during Advent or Lent MUST observe the spirit of the season. The spirit of these seasons is a time of preparation marked by a simplicity of life. Weddings during Lent and Advent, therefore, ought to have simpler wedding parties with respect to their number and adornment. The music used at wedding celebrations at this time ought to reflect the character of the season. Whatever decorations have been put up in the church during Advent or Lent, such as purple banners or advent wreaths, will not be moved or altered; those decorations represent the characteristic of the season for every celebration, including the sacrament of marriage. The half-hour rehearsal time will be with the wedding party and others involved with the liturgy. (Any musical rehearsal should take place at another time.) It should be scheduled based upon the availability of the Church. Priority for scheduling Friday evening rehearsals will always be secondary to the scheduling of weddings on Friday evenings. Out of reverence for Christ present in the tabernacle, appropriate dress and conduct is expected at all times. Alcoholic beverages are not permitted on the premises at the rehearsal or on the wedding day. You may have as many people as you wish in your wedding party except during the seasons of Advent and Lent. During those seasons, which call us to a simplicity of life, there should be no more than four members of the wedding party, which four includes the best man and maid of honor (with the bride and groom that makes a total of six wedding party members). There are only 4 kneelers to be used for the bride and groom, best man and maid of honor. The rest of the wedding party will be seated in the front pews on the side aisles of the church. Before you ask them to participate in the ceremony, please take into consideration the age of the ring bearer and flower girl(s) and junior bridesmaid(s) so that they may perform their function in the ceremony adequately. They should be at least 5 years old. You may want to incorporate friends or family members into the wedding ceremony: having one or two persons proclaim the readings from Sacred Scripture, announcing the prayer intentions at the Prayers of the Faithful, or (if the ceremony is within Mass) presenting the bread and wine at the preparation of the gifts. The wedding liturgy has two forms, either a wedding within the Mass or a wedding without the Mass. It is presumed that the former is the normal manner of celebration when both the bride and the groom share our Catholic faith. The option for a wedding without Mass is usually when either the bride or the groom do not share our Catholic faith. However in certain situations, Mass is held. This would be discussed with the celebrant of the marriage ceremony. In this way the celebration of the Sacrament of Marriage, a sacrament of unity, will not be followed by a sign of disunity—only a portion of the invited guests being able to participate in the Sacrament of the Eucharist. It is understood, furthermore, that when the Sacrament of Marriage is celebrated between a Catholic and an unbaptized person that the rite of Marriage without Mass is the proper manner of celebration. The wedding liturgy should be planned with the priest or deacon who will be the official witness of the church at your wedding. He will help you to prepare a ceremony which speaks of your love united in the love of Jesus Christ. The rest of the material listed will assist you in the preparation of the ceremony. The following elements of the ceremony may require special attention. Music that is selected for the ceremony in church, before, during and afterward, must be appropriate to the sacred character of the wedding liturgy. Therefore, all music to be used in church must be of a sacred character; show tunes, love songs, popular music and the like, while perhaps very eloquent in its evocation of the meaning of love and commitment, will be more appropriate for the celebration at the reception following your wedding liturgy. Our parish music director, Denny Anderhalter at 636-288-0912, will help you choose suitable musical selections for the wedding liturgy—all music for weddings must be approved by him. You may choose other musicians to perform your wedding music; please discuss this with the priest or deacon who is helping to prepare you for the sacrament of marriage for approval. Flowers are not required, but are welcome. Flowers or floral arrangements should not be placed on the altar table itself. There are stands available. Please do not affix decorations to any surface in church in a manner that will cause damage or mar the furniture (any tape, glue, epoxy, tacks, metals that will scratch, or the like, are prohibited). Try to treat the furniture in our church the way you would treat the furniture in your own home. Please make sure to inform whoever is placing your decorations of these requirements. See marriage booklet for details. Scattered rice, birdseed, confetti, flower petals, or similar substances are not permitted. Out of consideration for the safety of your guests and the appearance of the church and its grounds (we have no maintenance staff on weekends), we ask that you not use the aforementioned items. Balloons are not permitted in the church or the foyer of church. We ask that you appoint someone in your wedding party, the groomsmen or the ushers are likely candidates, to clean up after your wedding. They should help to put back the kneelers; remove tissues or programs from church pews; remove flower pieces strewn about the floors of the church, foyer, or basement; remove the boxes in which flowers or other decorations have arrived; and to clean the debris in the restrooms downstairs where the bridesmaids have readied themselves. There is a dumpster by the school cafeteria where all the debris can be placed. We ask, please, that you leave the church in the same condition in which it was found. Please inform whoever may be decorating for your wedding. Photos may be taken during the ceremony. Posed shots may be taken in the foyer of the church or the garden areas surrounding the church. The photographer should be instructed to be as inconspicuous as possible. Video may be shot during the ceremony, but the videographer must be instructed to pick an inconspicuous spot and to remain stationary throughout the ceremony. Please inform whomever you arrange to shoot pictures of your wedding of our guidelines. The parish asks a fee of $300.00 for parishioners who marry at St. Elizabeth; for non-parishioners the fee is $500.00. If the church supplies servers for the wedding it is customary to offer the servers a gift of $10.00 each. The church fee does not include the organist or musicians. The Liturgy of the Word, a proclamation of the Sacred Scriptures, is a major part of any wedding ceremony. The priests preparing you for marriage will give you a booklet “Together for Life” that contains all the readings, prayers and other parts of the ceremony. This is given to the couple by the priest who is going to perform the wedding ceremony.